It was Sunday August 28, I had been having contractions on and off for about a week and a half. My doctor had told me to take it easy, and I was, but that day I was feeling good. I wasn’t having contractions the way I had been and it was a nice day outside. Garrison and I were in the backyard enjoying the weather, picking a few weeds out of the ground, just hanging out. We didn’t have anything to do or anywhere to be so I decided “what the heck, I’ll go a head and just throw my hospital bag together.” So, I did. We cooked dinner, ate, watched a movie, and went to bed. As Garrison climbed into bed he made a comment about how he didn’t want to go to work in the morning…. I woke up needing to pee (no surprise there) and walked into the bathroom. I was standing 2 feet from the toilet when my water broke. It wasn’t a small trickle either, it was a huge gush of fluid so I was very confident that it was my water and not me peeing on myself. I was in shock, at 35 weeks pregnant I still had 5 weeks until my due date! And in my head I was thinking more like 6! I got myself cleaned up, and put on dry clothes before I went back into the bedroom to wake up Garrison and tell him what happened. He woke up and started getting dressed and getting all of our bags put in the car. I was trying to call the hospital to tell them we what happened and tell them we were coming but my hands were shaking so bad that I couldn’t even dial the number. Finally Garrison got it dialed and I spoke with a nurse who told us we needed to head in. After hanging up I called our doula, Hollie, to tell her what happened, and then we started the 40 minute drive to the hospital. The ride there was pretty quiet, I was scared; the nurse on the phone had asked when I had last felt the baby move and I couldn’t remember and she wasn’t moving around at the moment. All I could think about was that it was too early and I was so scared that she wouldn’t be born healthy. We got to the hospital and got checked in and were put in a room. Then we just waited.. I wasn’t having any contractions and her heart rate was good so there wasn’t a huge rush to do anything. Around 5:30 AM they came in and gave me my first round of steroids to help the baby’s lungs, we would get a second dose 12 hours later unless she came before then. We were hoping to be able to get both rounds in..
At 10 AM the OB on call came in to our room wanting to start pitocin to help things move, but we were really trying to avoid any interventions. We were able to get her to agree to wait and decided to have our doula come try and help us get things going using some more natural induction methods. At 4 PM my contractions were still very sporadic and not very strong so we agreed to the pitocin because we knew once we hit the 24 hour mark after my water had broken we would be booked in for a cesarean. Once they got the pitocin in, things started moving much quicker. The details from that point on are a bit more fuzzy. Our birth photographer arrived at some point and my dad and Garrison’s mom were in and out of our room a few times. I was having severe pain in my right hip that felt like the muscle was being pulled away from the bone with every contraction, I was stuck in the bed, attached to the monitor, and I was done. Around 7:30 PM I told my nurse I wanted an epidural. 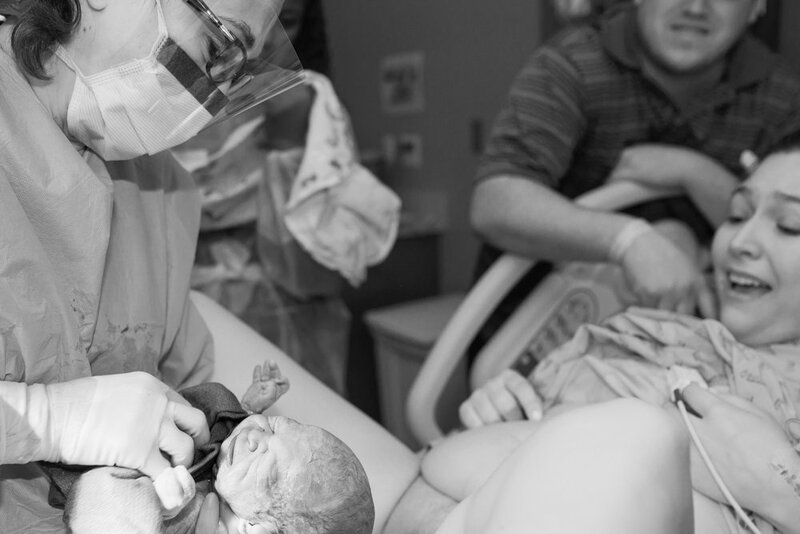 I cried as I asked for it, not from the pain, but from feeling like I was failing in my plan to have a natural, unmedicated birth. The anesthesiologist arrived and they began prepping me for the epidural. Once it was placed, we realized it was only working on the left side of my body and I was still feeling that horrible pain in my right side. Hollie and Garrison did what they could to help me cope with the pain while half paralyzed in the bed. I started pushing around 10 PM and at 10:29 PM Emmeline Rae Ritchie entered this world. All 5 pounds 3 ounces of her. She was so small and to our amazement, perfectly healthy. Our doctor was able to delay clamping and cutting her cord, Garrison got to cut the cord, and I got to do immediate skin-to-skin. We enjoyed our first blissful hour together as a family of three before inviting our family in to meet our newest little addition. Even though her birth didn’t go as we planned, it went just as it was supposed to, and at the end of the day we had our perfect, beautiful, healthy baby girl.